We are an independent Baptist church. We find our emphasis and focus solely on the authority of God's Word, the Bible. We seek to build up the body of Christ and love the world through the reconciling gospel of Jesus Christ. Our ministries include a Sunday school for all ages, children's church (grades PK-6), worship service both Sunday morning and evening, Wednesday evening Bible study and prayer meeting, monthly men's prayer breakfast, and a monthly women's Bible study. Pastor Doug King and his wife Heidi met while attending Pensacola Christian college. 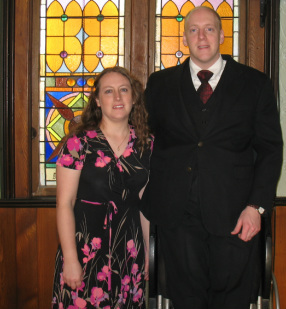 They both graduated from Pensacola Christian College with their bachelor degrees in 2003 and their master degrees in 2005 (Heidi) and 2006 (Pastor). Pastor King completed his Doctor of Ministry degree in 2018. Heidi grew up in a Christian home and was active in her church growing up and continued to serve while attending college. She has been involved in children’s ministries, including Sunday school, Awana, and children’s church. After graduating with her masters she served as the principal and teacher of her home churches day school in Ohio. Pastor King grew up in a pastors home and was instilled with the truth of God’s love for mankind and the proof of that love found in the Gospel of Jesus Christ (His death, burial, resurrection, and ascension to heaven). After graduating from high school the Lord allowed an accident to occur which resulted in his paralysis. He believes his paralysis is just a tool the Lord has given him to further serve the Lord. After graduating from seminary (2006) he served at First Baptist Church, Eden, NY as an assistant-pastor.